Miami was delicious. I was there to witness the unveiling of General Mills’ revamped Que Rica Vida site. It was awesome. General Mills comes off of this looking genius in the way it has smartly reached out in such a huge way to Latinos, Latino media and Latina/os who blog. Plus, my father just called from Miami to tell me he got a Que Rica Vida magazine delivered in the mail today. Que Smart Son! How to make me happy: Cafecito. The beautiful, funny, smart, talented, powerful Latina blog publishers I met in Miami during Que Rica Vida. 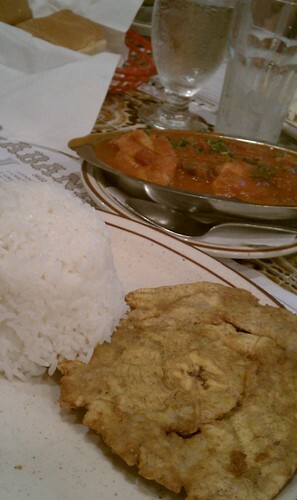 Pescado enchilado at La Habana Vieja, Coral Gables. 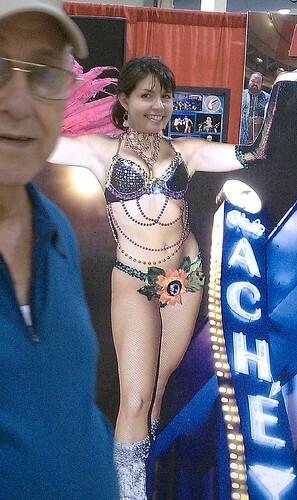 My new career: Showgirl. Taken at Cuba Nostalgia. Great pics! 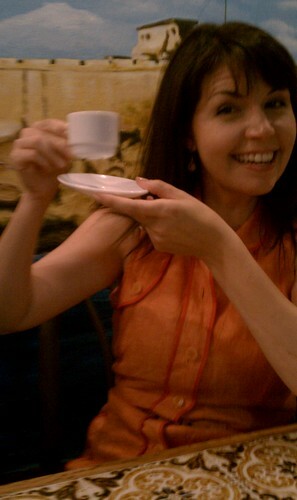 Can you believe I didn’t drink one single cup of coffee in Miami? Es casi pecado caray! .-= Silvia´s last blog ..Mamá Latina Tips está en Facebook! / Mamá Latina Tips is on Facebook! =-. I’m so happy to have met you. I felt like I knew you already which was pretty cool. While you’re trying to detox from Miami food, I’m here at home trying to re-create the experience by making mojitos and searching for guava cupcake recipes. LOL. Silvia, that is a total sin! I would have made you a cafecito myself had I known that. Tracy, when you find the guava recipe let me know…or I am going to have to talk InStyle into shipping them to me. It was so wonderful to meet you both…you both make me laugh and smile. LOVE that picture of you and my vecina, Marta. Both of you look great. .-= Liz´s last blog ..Alphabet Woof, A book review =-. Mi hija, eres como tu madre, cada dia te ves mas joven, asi es como debe de ser,lucir mejor as we age. How did I manage to miss you dressed as a showgirl? Thank you for bringing back a little piece of my childhood. I was raised in Miami, and left after high school to join the air force. 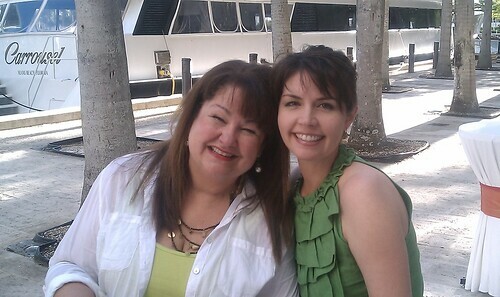 I have been all over the world, but only back to miami once…I still keep in touch with some of my amiguitas, and try to stay connected to my spanish speaking relatives…thank you for the laughs and memories. I look forward to devouring every word on your blogs and all related sites…. Melinda, happy to meet you. I am on a bit of a break, but there is plenty of stuff to read here…and please come visit over at the Tiki Tiki!